Wednesday, Feb. 13, 2019, 12:30 – 1:30 p.m. 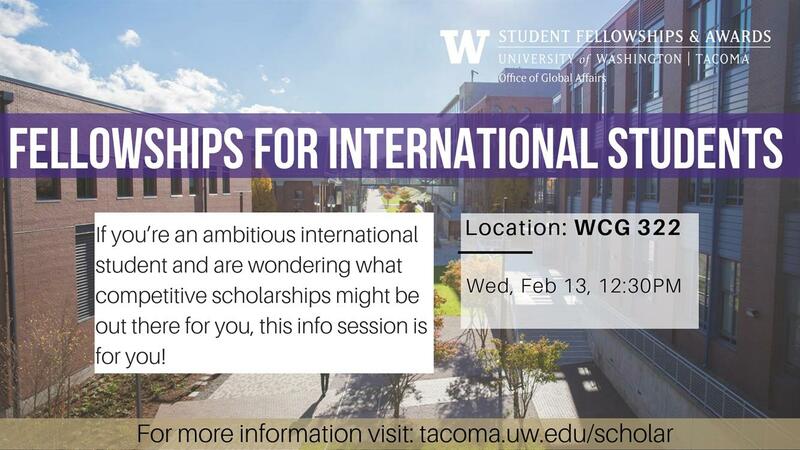 If you’re an ambitious international student at UW Tacoma and are wondering what fellowship opportunities might be out there for you, this info session is for you. You will hear more about awards such as the Gates-Cambridge Scholarship, the DAAD RISE, the Schlumberger Foundation Faculty for the Future program, and others. I will also share useful links to outside fellowships search engines. For undergraduate and graduate students.